You will receive an e-mail with hot links to the latest Kagan Online Magazine, as well as announcements about upcoming Kagan professional development events and new products. Please include your friend's e-mail address when subscribing. Remove yourself from Kagan's e-mail list. For the first USA Tour season ever, we are offering three new workshop options: Transform Your High-Risk Classroom, English Language Learners, and Kagan Structures for Little Ones. Reach and teach your most vulnerable students with Transform Your High-Risk Classroom. Develop language and academic skills with English Language Learners. Learn full engagement strategies for primary students with Kagan Structures for Little Ones. Other engaging workshops we offer on the Kagan USA Tour include Cooperative Learning, Win-Win Discipline, Thinking Skills, Brain-Friendly Teaching, and Accelerating Achievement. Sign up for a workshop to learn new structures and skills you can take back to the classroom to boost engagement immediately. Did you know that administrators have the opportunity to attend Kagan workshops free? Principals, vice principals, and approved district administrators can now attend Cooperative Learning Day 1 and Brain-Friendly Teaching Day 1 workshops for FREE. 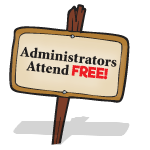 For all other workshops, one FREE administrator can attend with three paid participants and two FREE administrators can attend with five or more paid participants. Tell your principal! Click here for complete USA Tour schedule. All USA Tour workshops include FREE Course Materials and are presented by Nationally Certified Kagan Trainers. If you attend two or more workshops in the same city, you can save $50 or more. We hope you’ll join us on the 2019 Kagan USA Tour! 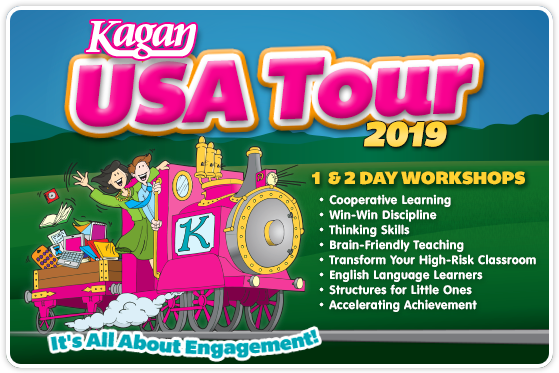 Click here for the complete schedule of workshops, locations, and dates for Kagan’s 2019 USA Tour.